Free Local Yeast Project Contributor pack. Once you’ve isolated a strain, becoming a Contributor is a simple as sticking a cultured swab in the included envelope and dropping it in a mailbox. Postage is pre-paid in the U.S.! As an added bonus: If you send your viable local yeast culture to Bootleg Biology, it will be banked in our laboratory freezer! 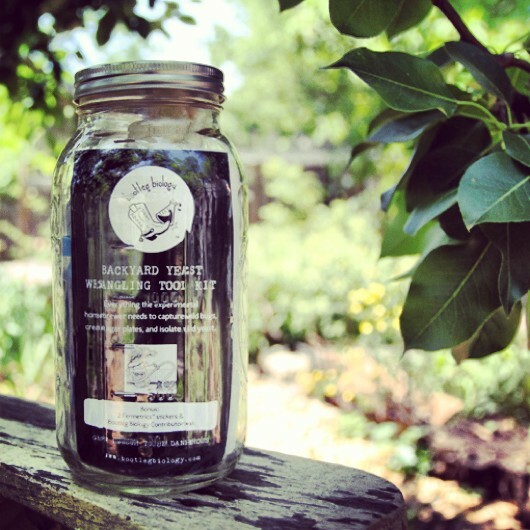 You won’t ever have to worry about losing your fantastic local yeast culture. Check out the YouTube video with Bootleg Biology’s Chief Yeast Wrangler acting as a hand model, demonstrating how to pour agar plates, streak cultures and isolate yeast. Canada & Australia: We now ship everything in our online store directly to Canada & Australia (except homebrew cultures)! 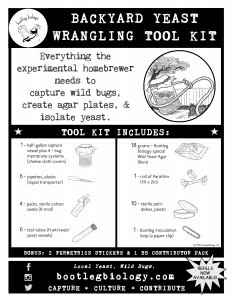 Want to see Yeast Wrangling Tool Kit’s at your local homebrew store? Let us know where! The Tool Kit is designed so that anyone who can make beer, can wrangle yeast. Each kit includes detailed illustrated step-by-step instructions as well as links to the DIYeast section of our site which is constantly updated with detailed information, graphics and a streaking video. Wondering how you’ll know what kind of microbe you’ve captured? Check out the original Microbe Portrait Gallery: a handy visual reference guide to the morphology (size, shape & color) of some of the most common brewing and fermentation bugs. The page has pictures of Brewer’s Yeast, Brettanomyces, and Lactobacillus on agar plates and under magnification. This will help you figure out quickly what kind of microbe you may have isolated using the Backyard Yeast Wrangling Tool Kit. But what if you also want to try isolating yeast from bottle dregs? The included Wild Yeast Agar Blend also grows the Brewer’s Yeast typically found in bottle-conditioned beers like a champ! Just add your dregs to a vial with low-gravity wort, incubate, and then follow the instructions for Isolating Yeast. What do you do if you get stumped during the process? Give up all hope? Call your High School Biology teacher? Nope! Each Tool Kit instruction manual includes an email address answered by our Chief Yeast Wrangler. No problem is too small, no question is too simple. We want you to become an amazing yeast wrangler, so we’re here to help! Still interested in reading more about the Tool Kit? Check out Heather Vandenengel’s interview with our Chief Yeast Wrangler in Craft Beer & Brewing: Yeast Wrangling for Homebrewers. Yeast Wrangling Tool Kit & Bootleg Biology Logo T-Shirt Bundle: Available only on bootlegbiology.com! Pick up a kit and t-shirt for one great price. A unique gift for the homebrewer that has it all! 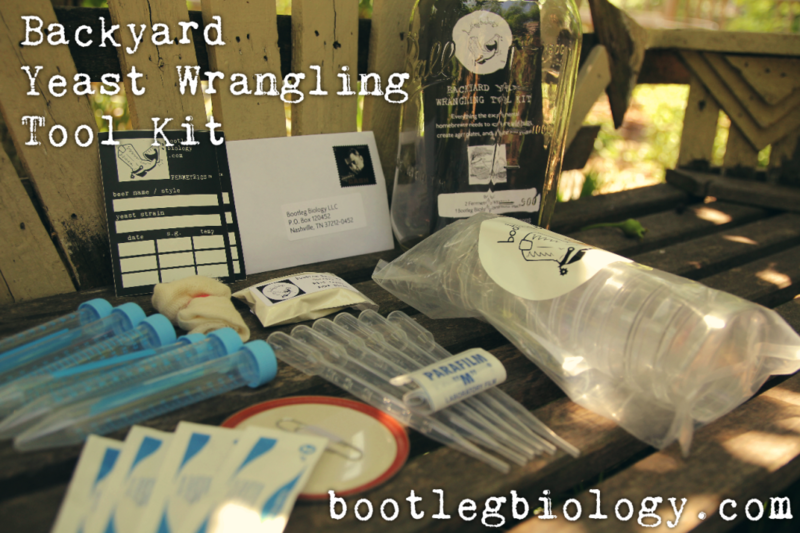 Yeast Wrangling Tool Kit, and Agar + Petri Dish Refill Bundle: Available only on bootlegbiology.com! Pick up a kit and our Official Refill Pack of 30 Petri Dishes and 60 grams of Wild Yeast Agar Blend for a special low price. This is the go to combo for all serious yeast wranglers. Wild Yeast Agar Blend & 30 Pack Sterile Petri Dishes – Get Bootleg Biology’s Wild Yeast Agar Blend and 3 sets (30 plates) of sterile petri dishes. Pickup this combo and make enough agar plates to go crazy streaking, isolating wild yeast AND brewer’s yeast! Petri dishes are 90mm size, larger than standard 60mm…increasing the ease of isolating a colony on the first try.